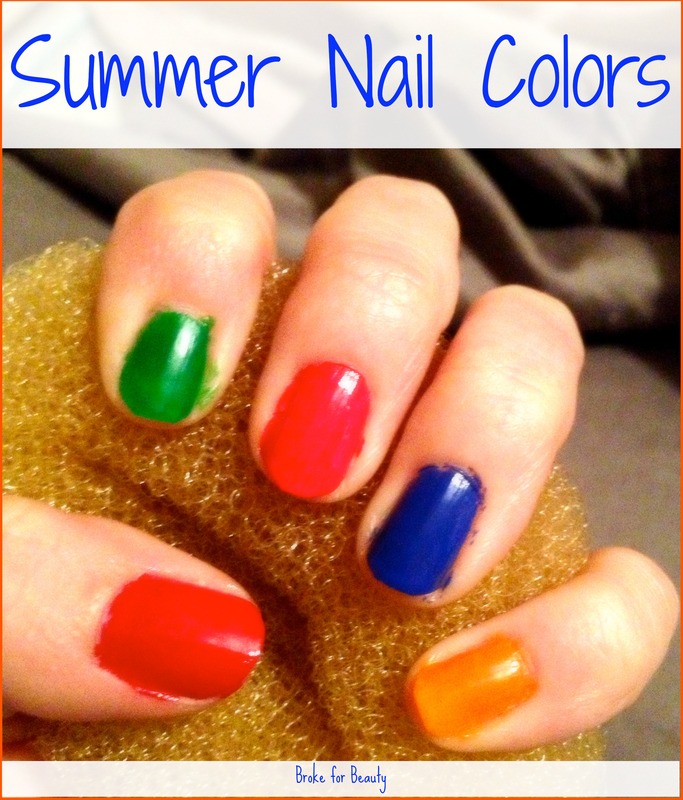 For my second Sunday Spotlight, I thought I’d focus on summer nail colors. I know everyone’s wondering where the summer went and starting to gear up for fall, but if that’s making you sad, let me remind you that fall doesn’t technically start until the end of September. So go on ahead and treat yourself to a bright and summery manicure—you have time! 1 Revlon nail polish in Revlon Red (680) – A beautiful, bright cherry red. It’s that classic red that looks great all year long. It goes on very opaque, so you only need one or two coats. 2 Hot Topic nail polish in neon green (no official name) – I love the toxic/poison look to this neon green. It also kind of reminds me of Nickelodeon’s slime from my childhood cartoon-watching days. It dries semi-matte, so definitely wear a top coat with this color. 3 Sally Hansen Insta-Dri in Sonic Boom (260) – My absolute favorite pink nail polish. It’s such a beautiful neon hot pink that goes on completely opaque and dries in just a minute or two. This is my go-to in a rush. 4 Nails Inc in Baker Street – I just got this sample from my mom’s Glossybox, as she wasn’t into the cobalt blue, but I was excited out of my mind. I love cobalt blue, and I’m so excited that now I can wear the color on my nails. I was really happy with the formula of this nail polish as well. It needed two coats but dried very quickly in between so it didn’t feel like a hassle. 5 Essie in Action (James Bond collection) – I grabbed this nail polish on sale at a salon. I love that it’s bright but not in-your-face orange. It goes on a little dull and matte, but a top coat fixes that pretty quickly. I hope you like these recommendations. Go wear them with pride! And don’t forget to let me know: What are some of your favorite nail polishes for summer?